Jimmy Carter succeeded Gerald Ford as 39th President of the United States from 1977-1981. One of his greatest achievements was being awarded the Nobel Peace Prize for his efforts with the Carter Center which he envisioned back in 1982 with his wife Rosalynn Carter. Born on October 1st, 1924, he is a descendant of Thomas Carter, an English immigrant who settled in Virginia in 17th century. Many generations of Carters lived in Georgia and worked as cotton farmers. He is also a descendant of the founder of Cornell University - Thomas Cornell. Carter grew up in the rural area of Georgia and lived on a peanut farm. He was raised as a Democrat and served two terms as the State Senator for Georgia between the periods of 1963 to 1967. This led to his promotion to the role of State Governor in 1971 and he remained in this position until 1975. His true calling came a year later when he defeated then President Gerald Ford in what could be considered a relatively close election at the time. He attended Plains High School from 1930 to 1941 and suffered through the Great Depression but his family and himself recovered and benefited from various farming subsidiaries that gradually came into effect. As a student, Carter was diligent and formed a great love of reading with his teacher at the time, Julia Coleman having a strong influence on him during adolescence. He played basketball, enjoyed woodwork and joined the Future Farmers of America. During his early years, Carter longed to be in the Navy and this began to come to fruition when he attended Georgia Southwestern College in 1941 and this resulted in his admission to the Naval Academy in 1943. Carter excelled as a student and was often considered quiet and reserved by his peers which often conflicted with the academy’s unique culture of aggression and hazing of the freshman. While studying, Carter fell in love with his sister’s friend Rosalynn Smith and after graduating in 1946, he would go on to marry and settle temporarily in California, New York, Connecticut, Hawaii and Virginia based on his various posts within the Navy. Eventually, he inherited his father’s peanut farm and through hard work and dedication from himself and his family, the business steadily grew after a slow start and he became quite successful. Carter’s desire to get involved in politics later stemmed from racial tensions within the community and he began to speak in favor of school integration. This is when his campaign for Governor ultimately began. Carter’s term as President is remembered for many different reasons. He established both the Department of Energy as well as the Department of Education. His national energy policy was also implemented around this time which aimed to provide guidelines for price control, conservation and emerging technologies. His reign oversaw a time of continuing recession and inflation as well as what was considered at the time as an energy crisis. Overall, his presidency has drawn fairly low responses from historians with many arguing that he has achieved more with his work post-presidency. 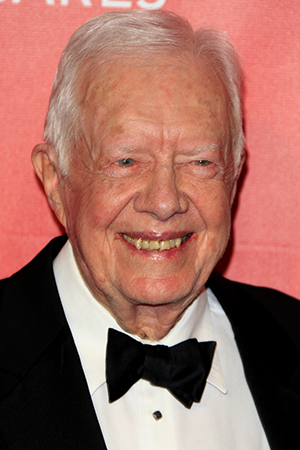 His Carter Center that was built in 1982 has been a massive success in the quest for advancing human rights. He has traveled all over the world to conduct peace negotiations and help advance disease prevention policies and with his post-presidency about to hit year 36, he is the longest retired President in American history! Carter has recently been battling cancer and successfully completed his treatment in early 2016 whereby medical scans showed no signs of any cancer. He is looking forward to his 92nd birthday this month, what an amazing life!